On November 12, Sears Holdings, DIP filed notice of hearing to approve the auction of $900.0 million principal amount of Medium Term Notes (MTNs) issued by Sears Roebuck Acceptance Corp. (SRAC), one of the Debtors. The hearing, originally scheduled for today, was adjourned to this Thursday, November 15. In other news, Sears announced that it will close 40 stores (including both Sears and Kmart units and the accompanying Sears Auto Stores) in February 2019. Liquidation sales at these stores are expected to begin late next week. This announcement is in addition to the previously announced closure of 142 unprofitable stores, expected to be completed near the end of the year, and 46 unprofitable units which are closing during November. On November 6, Taco Bueno Restaurants L.P., DIP filed for a pre-packaged Chapter 11 bankruptcy. The Company said it has formed a restructuring agreement with Taco Supremo LLC, an affiliate of Sun Holdings Inc. Sun Holdings is a multi-concept franchisee, with more than 800 locations across eight states, including Burger King, Popeyes, Arby’s, Golden Corral and Krispy Kreme. Sun Holdings had acquired all of Taco Bueno’s bank debt before the filing and committed to as much as $10.0 million in DIP financing for operations. Upon Taco Bueno’s completion of its restructuring, Sun Holdings intends to invest in remodeling Taco Bueno locations. Papa Murphy’s Holdings’ board is considering a range of financial and strategic alternatives to enhance shareholder value. The Company has engaged North Point Advisors to act as its financial advisor to assist with the review. Financial and strategic alternatives may include but are not limited to a possible sale of the business. Papa Murphy’s currently operates over 1,400 franchised and corporate-owned stores in 37 states, Canada, and the United Arab Emirates. After a year-long competition that drew interest from hundreds of cities and a number of states, Amazon has reportedly chosen New York’s Long Island City and Northern Virginia’s Arlington County’s Crystal City neighborhoods to split duty as its second headquarters. The development projects will bring the cities a giant infusion of jobs and tax revenue but will also stir controversy over impacts on infrastructure and property values. Back in 2017, the Company said the new headquarters would cost about $5.00 billion and bring with it about 50,000 jobs. Amazon has not disclosed how the money and jobs might be divvied up across two different sites. In other news, according to published reports, Amazon is offering steep discounts for its pilot shipping program that is being tested in the Los Angeles, CA area. One seller says Amazon’s shipping service was 50% cheaper than what was offered by UPS. The discounts show how far Amazon is willing to go as it expands its logistics network. Meanwhile, Amazon struck a deal with Apple Inc. that allows it to carry more Apple products globally in time for the holiday shopping season. Amazon previously sold a limited assortment that included Mac computers and Beats headphones. Lastly, Amazon announced plans to open a new “air gateway” and package sorting operation at Wilmington Air Park in Wilmington, OH. Amazon leases space at airports for the loading and unloading of packages to and from the aircraft, from trucks that drop off and pick up packages, and an onsite sort area for sorting packages based on their next destination. PriceSmart’s October sales decreased 0.8% to $244.9 million, driven by a comp decline of 1.3%. The Company added one new warehouse club over the past year, bringing its total store count to 41. Macy’s is investing $200.0 million to overhaul 50 locations across the country this year. The Company is concentrating its capital investments on its 50 best-performing locations, with the goal of improving the shopping experience and boosting sales. CEO Jeffrey Gennette commented back in September that early performance of these stores is strong, and the Company will continue next year with the next batch of 50 stores to be renovated under the Growth50 program. Growth50 varies by location. Last week the Company unveiled a renovated store in its hometown of Cincinnati, OH; the store received several cosmetic changes, including new floors, LED lighting, and more comfortable restrooms and fitting rooms. The Company also hired an additional 20 employees for the store. Another location in Columbus, OH received a virtual furniture display for shoppers to see how their purchase would look in a 360 degree video display. Other stores received an augmented-reality display at the makeup counter that lets shoppers virtually try on up to 250 different cosmetic brands. And other locations are testing a pop up shop from Facebook, which features merchandise from up to 100 small businesses. On November 5, Hibbett Sports completed its previously announced acquisition of City Gear, LLC for $88.0 million in cash. As a result of the transaction, City Gear became a wholly owned subsidiary of Hibbett Sports. Hibbett funded the acquisition with cash on hand and borrowings from its two credit facilities. On October 29, Hibbett amended its demand note with Bank of America, providing for an increase in the amount of credit available under both unsecured revolving credit facilities from $30.0 million to $50.0 million. The Company, which may use the proceeds of borrowings for general business purposes, borrowed $50.0 million to pay a portion of the City Gear purchase price. American Eagle Outfitters is the lead investor in a $3.45 million Series A investment in Dormify, an online retailer that sells college and dorm supplies. The deal extends an existing relationship between the two companies, under which American Eagle sells Dormify collections online and at its Union Square store in New York City. Dormify plans to use the investment to scale talent, expand pop-up locations, and enhance the online experience for their customers. Additional pop-up locations will be launched in spring 2019 to coincide with college decision day for incoming students. Three pop-up stores opened this year in May, in New York City, Chicago, and Washington D.C. Customers were able to explore merchandise and styling ideas before making purchases, as well as order merchandise in-store and have items shipped directly to their dorm. Dormify is also expanding its on-campus ambassador program. Casey’s General Stores acquired Saukville, WI-based Tri-Par Oil Co., adding seven Qwik Stop locations in Saukville, Newburg, Cedarburg, Random Lake, Slinger, West Bend and Hustisford, WI. Tri-Par will close its stores at the end of the month, and they will subsequently be rebranded as Casey’s stores. Aldi is expanding in the Green Bay, WI area. It recently opened a store in Ashwaubenon and will open one in De Pere next week as well as unveil a newly remodeled location in Marinette. These Green Bay locations join two existing ones, which were remodeled a few years ago. 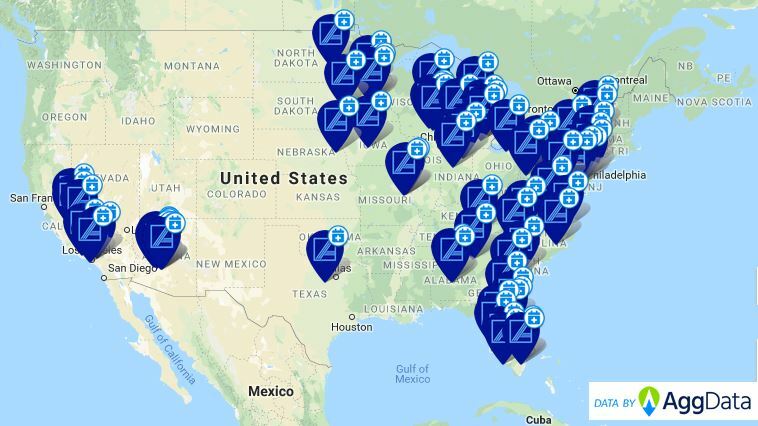 A map of Future Aldi Store Openings can be seen below. If you're interested in a list of all future Aldi locations, click here. Stater Bros. opened its first store in Pasadena, CA, its 26th location in Los Angeles County. The 42,000 square-foot unit features an expanded organic selection, more prepared food offerings, and an extensive wine and beer collection, among other things. Meijer plans to open a new store in Bad Axe, MI in 2020. The closest Meijer store to Bad Axe now is in Essexville, about an hour away. 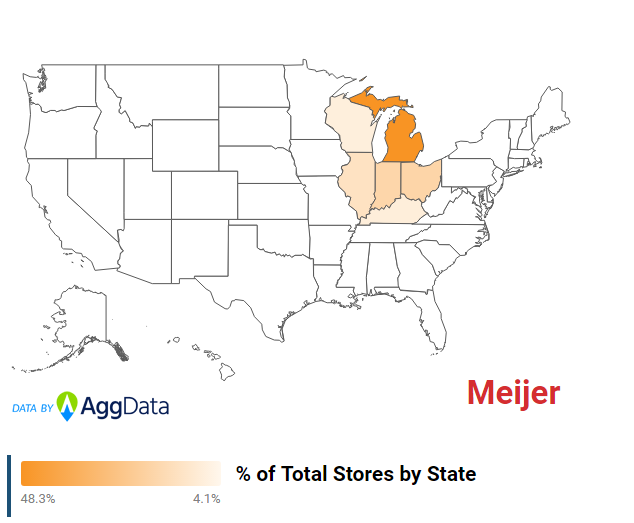 The Company currently has 117 stores in Michigan, or close to 50% of its store base - see below for Store Concentration Map. Starbucks is targeting Japan for growth, with plans to build 100 new stores there each year for the next three years. The new locations will bring the number of Starbucks stores in the country to 1,700. It also announced it is teaming up with Uber Eats Japan to launch a food and beverage delivery service in Tokyo. The pilot program began on November 9 in six stores, with plans to expand the program within the next two years. Starbucks is also partnering with Line, Japan’s leading social platform, in a deal that will enable it to innovate across various technologies. The first phase will launch in the first half of 2019, and connect Starbucks to Line’s more than 78 million users across Japan. Starbucks Japan will begin piloting a mobile order and pay program in 2019. BJ’s Wholesale Club plans to open a new store in Clearwater, FL in a former Kmart, in 2019. The Company currently operates 217 stores, 32 of which are in Florida. Third quarter results are expected to be released on November 20. Ahold Delhaize announced results for its third quarter ended September 30. During the quarter, net sales at Ahold Delhaize USA grew 3.2% at constant exchange rates. Comps, excluding fuel, increased 3%, with positive volume growth during the quarter. The negative impact from Hurricane Florence on comparable sales growth was estimated at 0.5% for the segment, resulting in adjusted comp growth of 2.5%. Online sales increased 11.8% to €185.0 million, supported by improving sales trends at Peapod. In other news, Ahold Delhaize announced that Selma Postma has been appointed brand president of Peapod, effective January 1, 2019. Most recently, Ms. Postma served as general manager of Albert Heijn Online. Ahold Delhaize’s Giant Food Stores (Carlisle, PA) plans to acquire five Shop ‘n Save supermarkets from Supervalu. Financial terms of the deal were not disclosed. 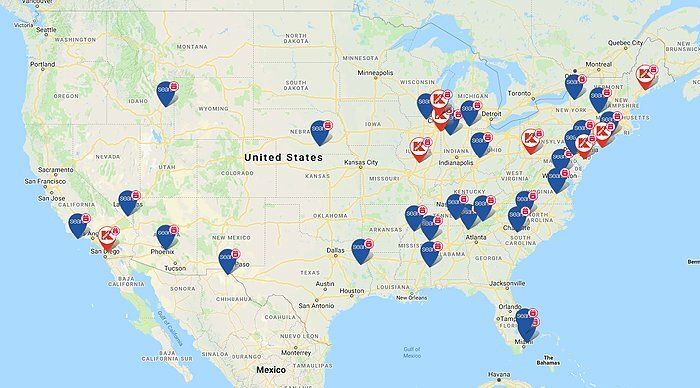 Giant will convert the Shop ‘n Save stores located in Smithsburg, MD; Greencastle, PA; Berryville, VA; and Hedgesville and Martinsburg, WV to its Martin’s Food Markets banner. The transaction is slated to close in the first quarter of 2019. Giant noted that the acquisition reflects its ongoing expansion plans, particularly in Pennsylvania. In June, the chain unveiled a $22.0 million investment plan for Lancaster County that includes a 38,000 square-foot e-commerce hub, four store remodels and a price-cut program, and a new fuel station at its Lititz store. That investment builds on a $70.0 million plan, announced in April, to expand Giant’s store network across the state, including six new stores, two store remodels and four new fuel stations over the next two years. Last month, it unveiled Giant Heirloom Market, a compact urban store format due to open later this year in Philadelphia and, on November 16, it will open a store in Lancaster, which was acquired in September from Darrenkamp’s Markets. 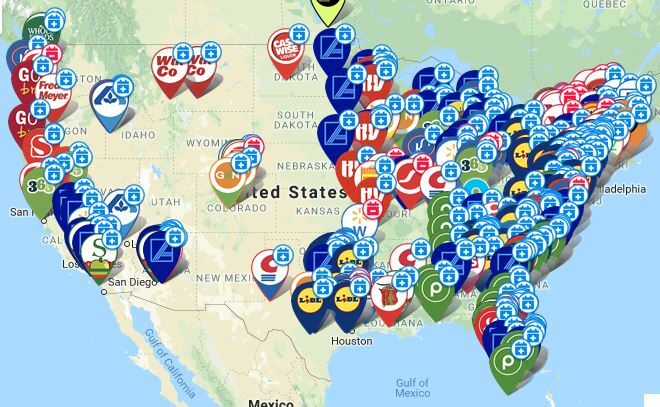 Overall, Giant operates 171 stores in Pennsylvania, Maryland, Virginia and West Virginia under the Giant Food Stores and Martin’s Food Markets banners. Camping World’s third quarter sales increased 6.2% to $1.31 billion, due primarily to store openings, slightly offset by comps falling 10.1%. The Company opened 85 new locations, including 60 Gander Outdoors units. EBITDA fell 17% to $100.1 million, while EBITDA margin eroded 220 basis points to 7.6%, due primarily to SG&A and gross margin deterioration. The increase in SG&A expenses was primarily driven by incremental wages and selling expenses associated with the additional locations opened over the past year. TTM EBITDA margin was 7.8%, down from 9.4% in the prior-year period. Interest expense jumped 32.9% for the quarter, and TTM interest coverage dropped to 3.9x, slightly above our warning sign of 3x. GNC Holdings reported third quarter revenue declined 4.8% to $580.2 million as a result of negative comps, lost sales from the divestiture of Lucky Vitamin, fewer franchised locations, and the discontinuation of the Gold Card Member Pricing Program. Domestically, comparable store sales fell 2.1% (compared to a 1.3% improvement last year). On a positive note, International sales grew 6.1% to $51.4 million, driven by positive comps and stronger sales in foreign franchises. Gross margin eroded 50 basis points due to increased promotional activity. Second quarter SG&A margin increased 190 basis points, reflecting increased advertising expenses and higher corporate overhead as well as the deleveraging impact of the lower sales base. Ultimately, EBITDA decreased 23.7% to $48.3 million, and EBITDA margin fell 210 basis points to 8.3%. GNC generated $42.3 million in free cash flow for the year-to-date of fiscal 2018, which was primarily used to pay off the revolver and original issuance fees relating to the new credit facility. During the Company’s conference call, GNC said it conducted a strategic review of its store base and has identified approximately 700 – 900 stores in the U.S. and Canada that will be closed within the next three years at the end of their lease terms. This review also identified other stores in which they are considering alternatives such as seeking lower rents or shorter terms. On November 6, GNC announced it reached a definitive agreement with Harbin Pharmaceutical Group (Hayao) for the funding of Hayao’s previously announced $300.0 million strategic investment in GNC, which will be in the form of convertible preferred shares with a conversion price of $5.35 per share and an interest rate of 6.5% (which can be either paid in kind (PIK) or cash). Hayao’s investment in GNC will be funded in three separate tranches: an initial $100.0 million investment made on November 9, an additional $50.0 million investment to be made by December 28, and a final approximately $150.0 million investment to be made by February 13, 2019. Additionally, Hayao designated two directors to the GNC board, and three more will be appointed at a later date, increasing to an aggregate of five directors after completion of the second investment. The two companies are planning to set up a Chinese joint venture, which would be 65% owned by Hayao, giving Hayao the exclusive rights to use GNC’s trademarks and manufacture/distribute its products in China. In turn, GNC will collect royalties on all goods sold. Party City’s third quarter sales decreased 1.3% to $553.0 million. Retail sales increased 3.2%, driven primarily by square footage growth from store acquisitions; brand comps slipped 1%. Wholesale revenues decreased 9.4%, or 4.8% after adjusting for the impacts of currency and franchise store acquisitions. Gross margin increased 60 basis points on lower promotional spending and a positive sales mix, partially offset by increased freight and distribution costs and increased commodity pressures. Adjusted EBITDA fell 10.1% to $59.4 million. October sales increased 2.5% to $486.8 million, with retail revenue up 4%, driven by North American web growth of 16.6%, and square footage growth. Brand comps decreased 2.8%. Halloween City sales per store increased 14.1% over the prior year. During the Halloween season, the Company operated 249 temporary Halloween City stores, compared to 272 in 2017. Ulta Beauty announced that comps for the third quarter ended November 3, including e-commerce sales, increased 7.8%, primarily driven by transaction growth. This is at the high end of its August 30 guidance for 7% – 8% comp growth and comes on top of its 3Q17 comp increase of 10.3%. Retail comps were up 4.4%, including salon comp growth of 3.3%. E-commerce sales grew 42.2%, on par with expectations; e-commerce sales make up roughly 9% of total sales. The Company expects to report EPS at the high end of its prior guidance of $2.11 – $2.16; 3Q17 EPS was $1.70. Ulta plans to report full earnings on December 6 after market close. Looking ahead to fiscal 2019, 2020 and 2021, the Company expects to achieve comp growth in the range of 5% – 7%, and grow EPS in a mid to high teens percentage range. Ulta aims to generate modest operating margin expansion each year through new investments in supply chain, digital innovation, and guest experience, as well as a comprehensive cost optimization program. The program, which the Company is calling “efficiencies for growth” is expected to generate $150.0 million – $200.0 million in cost savings to fund investments and future growth initiatives. In its recent earnings call, management said it will be slowing the pace of store openings after 2018; it plans to open 80 stores in 2019, followed by 75 stores in 2020, and 70 stores in 2021. Ulta has grown by 100 stores per year since 2013; it currently operates 1,163 stores that average 10,000 square feet, with most of its store base located in power centers (outdoor shopping malls). Management said that the current rate of growth has caused some cannibalization, which negatively impacted comps by 1.3%. Creditntell analysts note that this may be a contributing factor to the decision to reduce the pace of store growth. Management expects to open 100 total stores in 2018, to end the year with 1,173 locations, and it anticipates reaching 1,399 stores by 2021. Finally, management is targeting e-commerce fulfillment of two-day delivery by 2021.